For the month of April (and the first couple of days of May), this blog will be looking at the nominees for the 2014 Pat Lowther Memorial Award, Raymond Souster Award and the Gerald Lampert Memorial Award as recognized by the the League of Canadian Poets. The Pat Lowther Memorial Award is given for a book of poetry by a Canadian woman published in the preceding year, and is in memory of the late Pat Lowther, whose career was cut short by her untimely death in 1975. The award carries a $1,000 prize. It is presented each year at the League’s Annual General Meeting in May or June, with the shortlist announced in April. The Raymond Souster Award is given for a book of poetry by a League of Canadian Poets member (all levels, dues paid) published in the preceding year. The award honours Raymond Souster, an early founder of the League of Canadian Poets. The award carries a $1,000 prize. It is presented each year at the LCP Annual Poetry Festival and Conference in June, with the shortlist announced in April. The Gerald Lampert Memorial Award is given in the memory of Gerald Lampert, an arts administrator who organized authors’ tours and took a particular interest in the work of new writers. The award recognizes the best first book of poetry published by a Canadian in the preceding year. The Award carries a prize of $1,000 and is sponsored by the League of Canadian Poets. It is presented each year at the League’s Annual General Meeting in May or June, with the shortlist announced in April. What a poverty of words. every time we try to name them. his face, his face, his face. page 92 of her Collected Poems, What The Small Day Cannot Hold. If there is a more beautiful and haunting poem about loss I'm pretty sure I don't want to read it today. 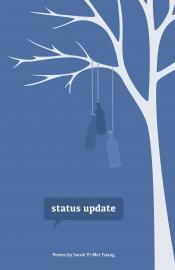 Sarah Yi-Mei Tsiang uses FaceBook updates as a spring board to launch her whimsy. It is clear to this reader that Tsiang is so sure footed she can navigate with her eyes closed. These 'chirps' off of FB could just as easily be obscure quotes from any source, it wouldn't matter in the least. Tsiang sees the poetry. Sue Fisher I burned it. http://michaeldennispoet.blogspot.ca/2013/04/sweet-devilry-yi-mei-tsiang.html) that it won last years Gerald Lampert Award. Status Update is now nominated for the Pat Lowther Memorial Award. This isn't an accident, random, or coincidence. This is what happens when someone of such elastic wisdom and giddy grace comes out of the gate singing electric. This is why we read books of poetry. the 21 years gone by. and their death displaces you. Last walk of the evening, and the dog lags in long, slow steps. This summer has set the stars to panting. with the post. We are both in love. My steps recite your words and the sidewalk glimmers with your genius. The dog and I imagine love in lost messages. What have we become? washing dishes, talking on the phone, the cord twisting. An empty house, a wandering spirit, a girl. and so it becomes one. Every night she imagines him touching her brow. when we are just pretending to live them. There is only one way to love but there is no how. because they have nothing of their own. So it is with love. If not pebbles, let's say, comfrey. but the ache of you is a ghost in the marrow. and their deaths displace you. we had to redraw all the maps. Sarah Yi-Mei Tsiang's poetry is utterly convincing, completely engaging and thoroughly enjoyable across the entire spectrum of my palette. I liked these poems so much I wanted to steal them and keep them for myself. Sarah Yi-Mei Tsiang is the author of Sweet Devilry (Oolichan Books), which won the Gerald Lampert Award for best first book of poetry in Canada and was nominated for the Re-Lit Award. Her work has been published widely in journals and anthologies, and appears in Best Canadian Poetry 2013 (Tightrope Books). She is the editor of the all-Susan anthology Desperately Seeking Susans, as well as the forthcoming anthology Tag: Canadian Poets at Play (Oolichan Books). Sarah is also a children's author and essayist. Her new Young Adult novel, Breathing Fire (Orca Books), is forthcoming in Spring 2014. "I read Tsiang's work and was taken immediately by how well she navigates our time. She injects poetry into our online community, which is becoming like a park in the city where we as poets meet to exchange and share our news. And she does it with the spirit I've come to expect from her: wild, funny, proper. Tsiang adds some much-needed verve and sass to Canadian poetry." "As Tsiang's poems depart from life to virtual life to burning imagination, they become strangely illicit. You wonder about your own conduct. Should you be reading / so closely / the lives of others?"